Home Guides Angry Birds Action! Thank you for printing this page from www.SuperCheats.com. Remember to come back to check for updates to this guide and much more content for Angry Birds Action! Angry Birds Action! 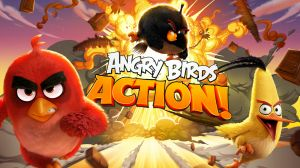 is Rovio’s latest Angry Birds inspired title, this time round it's a 3D 'smash-em-up' game based on 'The Angry Birds Movie'. Unlike previous games in the title you will need a certain amount of luck as well as skill to get through the 90 levels. The story revolves around Red who has been blamed by all the birds for the destruction of the village and he has to somehow find evidence to prove he is innocent. ASK A QUESTION for Angry Birds Action! No discussions open for Angry Birds Action! at the moment.